The Louisiana Tech University chapter of the Sigma Xi Research Honor Society is launching its 2018-19 Science Café discussion series at 5:30 p.m. Oct. 16 at Ruston Artisans, 203 W. Alabama Avenue in Ruston. The Sigma Xi Science Café is a series of public “chats” with researchers held during the fall, winter, and spring academic quarters. Members of both the campus and local communities can have a conversation with a scientist, and the cost to attend is free: this year’s series is sponsored and hosted by Ruston Artisans. 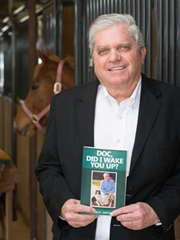 Dr. William Green, DVM, Professor and Director of Agricultural Sciences & Forestry, will kick off this year’s series with a discussion titled, “Veterinary Medicine: Past, Present, and Future.” Green is the author of Doc, Did I Wake You Up?, a book about his experiences as a small-town veterinarian. In Tech’s Winter Quarter, Dr. Lindsey Keith-Vincent will discuss SciTech’s programs. In the Spring Quarter, Dr. Mark DeCoster will discuss his work with the BRAIN initiative. The idea is for the Science Café to be less formal than a typical lecture so people can engage and feel comfortable asking questions. Sigma Xi will provide appetizers and beverages for guests during a social held from 5:30-6 p.m. The talks will begin at 6. For more information, contact Dr. Terri Maness at tmaness@latech.edu.